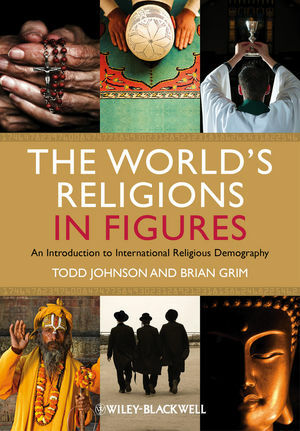 Created by two of the field’s leading experts, this unique introduction to international religious demography outlines the challenges in interpreting data on religious adherence, and presents a contemporary portrait of global religious belief. Todd M. Johnsonis Associate Professor of Global Christianity at Gordon-Conwell Theological Seminary and Director of the Center for the Study of Global Christianity. He is Visiting Research Fellow at the Institute on Culture, Religion, and World Affairs (CURA) at Boston University, where he co-edits the World Religion Database. Professor Johnson is the co-editor of the Atlas of Global Christianity (with Kenneth Ross, 2009) and co-author of World Christianity Encyclopedia, 2nd Edition (with David Barrett and George Kurian, 2001) and World Christian Trends (with David Barrett, et al, 2001). He is also the editor of the World Christian Database. Brian J. Grim is Director of cross-national data and Senior Researcher in religion and world affairs at the Pew Research Center’s Forum on Religion & Public Life in Washington, D.C. Dr Grim is also Visiting Research Fellow at the Institute on Culture, Religion, and World Affairs at Boston University, where he co-edits the World Religion Database. He is co-author of The Price of Freedom Denied: Religious Persecution and Conflict in the 21st Century (with Roger Finke, 2011).